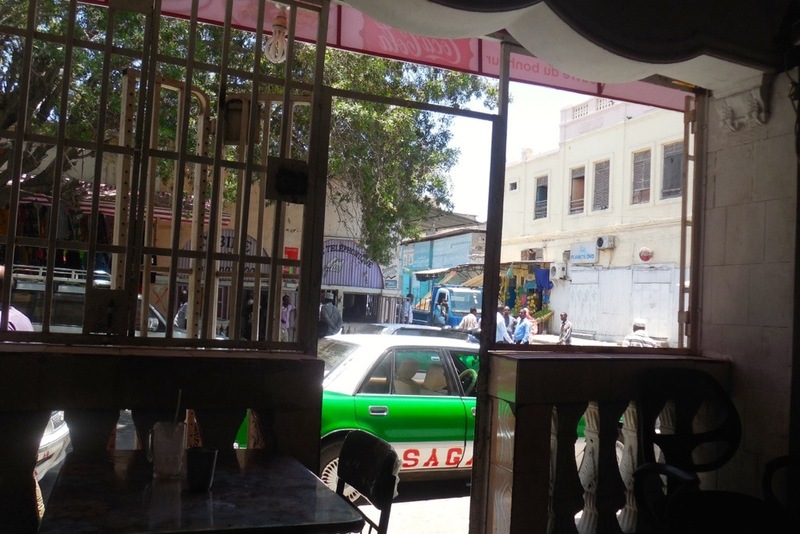 Nearly everyday that we were in Djibouti, my traveling companion (M) and I visited the juice bar at Cafeteria Sana’a a couple blocks from our hotel. It was normal a late morning break, usually after our second walk around the city. Around 7:30 a.m., we’d have breakfast on the porch of our hotel, a cup of café crême with a big cube of sugar accompanied by a basket of baguette slices and a couple croissants. The plates that came with the basket had a dollop of strawberry jelly and a large pat of butter. With my recovering broken hand, sometimes the butter started too cold to manipulate but within seconds it literally would begin to melt. After this breakfast, we’d walk. With temperatures at 90 degrees F (even that early) and humidity around 85 percent, it didn’t take long to find ourselves drenched in our own perspiration. We’d return to our hotel to drink a liter of water and let ourselves dry out and then we’d repeat. On the second morning tour, we capped everything off with a juice from Cafeteria Sana’a. The first day I ordered ginger juice. I thought, since gastro-international issues can pop up during travels in Africa, ginger would help keep my insides healthy. It was fabulous. Spicy and zesty and refreshing, even 20 minutes later still walking around in the heat that ginger juice left and incredibly pleasant taste in my mouth. The next visit they had run out of ginger. This afternoon, they said. I was heartbroken so I let M order me a mango. It was delightful but lacked the zip and surprise of the ginger. We returned the next day. No ginger. Maybe tomorrow, they said. I ordered “melon.” I had no idea what type of melon to expect. I’m not a huge melon fan, but isn’t the point of traveling to expand your horizons and be adventurous? Would it be watermelon? Honeydew? Cantaloupe. Served in a frozen mug. Not as breathtaking as ginger but a flavor I soon learned to crave after an hour or two in the hot sun. That day we had a second juice, lemon. Our server offered us lemon with mint, something not on the board, but at this point we may have become regulars. This became M’s pick. The final trip to the juice bar we ordered large juices instead of regular. Still no ginger. So I stayed with my melon. – Take and bake Archer Farms baguette with Brie from Aldi and a chunk with butter. – Simply Balanced green tea with ginger. My first attempt at my own cantaloupe juice smoothie included about 2 cups cantaloupe and 1/2 cup water in the blender. Suitable, but lacked the frozen mug.